Last year’s The Philosopher’s Flight from debut author and ER doctor Tom Miller was perhaps one of the biggest surprises of 2018. Set in an alternate World-War-I-era America and blending together historical fiction and fantasy, The Philosopher’s War will continue the story of Robert Weekes, who becomes the first man allowed to fly in the US Sigilry Corp’s Rescue and Evacuation service in a world where magic is a field dominated by women. I’m curious to see how the protagonist will continue navigating the gender-flipped society as well as the war-torn skies of the First World War. “The second book in the thrilling series that began with The Philosopher’s Flight finds Robert Canderelli Weekes as a rookie Rescue and Evacuation flier on the front lines of World War I in France. He came to save lives, but has no idea how far he’ll have to go to win the war. Thanks to a stunning flying performance and a harrowing shootout in the streets of Boston, Robert Canderelli Weekes’s lifelong dream has come true: he’s the first male allowed to join the US Sigilry Corps’s Rescue and Evacuation service, an elite, all-woman team of flying medics. But as he deploys to France during the waning days of the Great War, Sigilwoman Third-Class Canderelli learns that carrying the injured from the front lines to the field hospital is not the grand adventure he imagined. His division, full of misfits and renegades, is stretched the breaking point and has no patience for a man striving to prove himself. 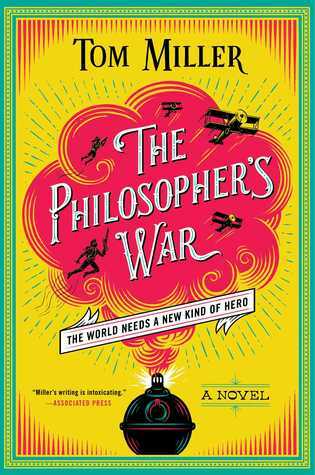 Slowly, Robert wins their trust and discovers his comrades are plotting to end the Great War by outlawed philosophical means. Robert becomes caught up in their conspiracy, running raids in enemy territory and uncovering vital intelligence. Friends old and new will need his help with a dangerous scheme that just might win the war overnight and save a few million lives. But the German smokecarvers have plans of their own: a devastating all-out attack that threatens to destroy the Corps and France itself. Naturally, Robert is trapped right in the thick of it. Neat cover, and love the alt-history take! I love the covers too. Such boldness! I clearly missed The Philosopher’s Flight entirely, but I’m loving the sounds of this series. Another one to catch up on! I’m thrilled too, I wish this series was getting more attention! Literally just heard about The Philosopher’s Flight the other day from some friends that were going on about how good it was. I really need to get on this series! I’m not aware of this series but that is an eye-catching cover. Hope this one is as good as the first for you. Yeah, interesting color choices, right? Really stands out! It’s a very bright and interesting cover! Hope you enjoy it!